Every year we haul corn out of the grain bins in December or January to the elevator. 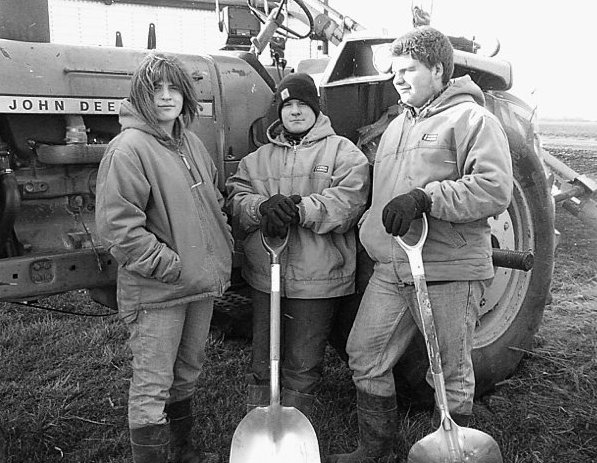 The kids are always giddy about pushing their favorite shovel to move corn, as you will see in the video. Usually the weather is bitterly cold but emptying the last bin the beginning of this Jan. was unusually warm. Here is the video from last year. You can see the difference in the kids’ sizes in just one year. They eat lots of beef. The drillers came and did what they do best and put a 140′ hole in the ground for our new well. They said it was good for 90 gallons/minute. William is just giddy about having water. The picture above was early in the morning. The picture below was what was left after they did their magic. They were pumping air down the hole to bring up water ’til it ran clear. So we had a 6ft fountain in our hay field. Next time you see William congratulate him on his new well. I think he would pass out cigars if he had any. Below is the video we made for his blog. We are a family of 5 (William, me, and 3 kids; 16, 14, & 13 yo). The following is what we did this past week in addition to the daily cattle chores and school work. Picked up load of soy bean seed; switched planter units over to beans; ect. Like the socks that are eaten by the washing machine, there are four things (sometimes more) that never seem to make it back to where they belong. 1/2 in. wrench: For some reason this size wrench is never to be found on or near the equipment that is being worked on. But if someone goes to another shed, a fist full of them are within a few steps of each other. Duct Tape: This one might be unique to this family. The duct tape roll (or rolls) are always hard to put our hands on. We even have a pink roll that can be difficult to find. Pliers: These win the most elusive prize. We could buy a pair of pliers every trip to Big R or Tractor Supply ;and we’d still never have a set on hand when we need them. I believe pliers do have legs that carry them out of tool boxes never to return. Do you have things that “have legs” around your place?